Accolade Technology was founded in 2003 and provides the most technologically advanced, lossless packet capture and acceleration adapters and acceleration platforms available in the market. Accolade’s ANIC line of 1-100GE adapters are FPGA-based and help accelerate security and networking applications developed by the world’s leading security and networking vendors. ANIC adapters are fully PCIe compliant and seamlessly integrate into standard servers offered by companies such as Cisco, Dell, HP, Super Micro and others. Accolade offers the ATLAS-1000 platform exclusively to OEM customers and systems integrators in the security/network monitoring markets. When Accolade’s OEM customers integrate their software applications with the ATLAS-1000 platform’s acceleration features sets the combined solution evolves into a network monitoring or security appliance. Accolade’s OEM customers are network appliance vendors that offer products for network monitoring/forensics, deep packet inspection, video stream monitoring, network test and measurement, high frequency trading (HFT), high performance computing (HPC) and more. There are three key reasons why customers choose Accolade Technology for their security and network application acceleration needs. Accolade is the technology leader in the FPGA-based, lossless packet capture and acceleration market. Over many years, the company has consistently delivered innovative products and features to meet customer needs and expectations. 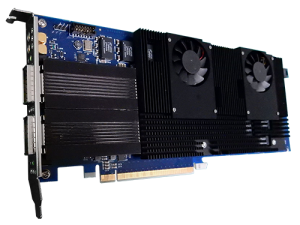 There are many vendors that provide “raw” FPGA-based cards, leaving the customer to figure out what to do with the hardware. In contrast, Accolade provides not only the hardware, but also in-house developed intellectual property as well as customized functionality if required. This is crucial because with Accolade a network appliance vendor has a single partner that can provide hardware, leading edge intellectual property along with support and software integration resources to bring an entire solution to market in record time. Many appliance vendors believe they can build all needed functionality themselves and sometimes entirely in software. This may be true, but is building everything yourself the most optimal use of time and resources? Accolade has accumulated vast expertise over the past decade by working directly with many security and networking vendors just like you. Let Accolade show you how to substantially cut your time to market with a 60-day, cost free product evaluation.